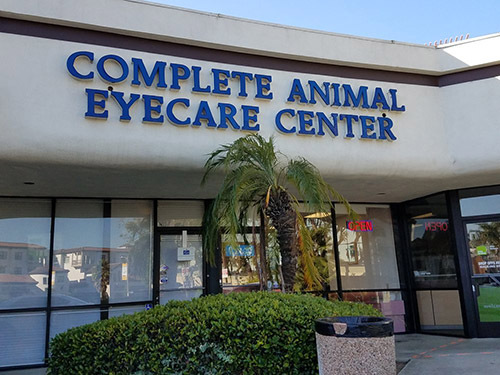 Complete Animal Eyecare Center provides full service veterinary and animal eye surgery services for small animals, large animals, avian and exotic pets in the Greater Los Angeles, San Fernando Valley and Santa Clarita areas including: animal cataract surgery, animal eyelid surgery, animal glaucoma treatment, veterinary retinal reattachment surgery, animal ocular laser surgery, veterinary corneal ulcer therapy, and other animal ophthalmology services. (Please see video links for cataracts and vitreoretinal surgery). Patients are seen by appointment only. Our hours are Monday thru Friday, 8:00 am to 5:30 pm, and Saturday, 8:00 am to 12:00 noon. Equine Ophthalmology Equine Ophthalmology Examinations should be arranged by appointment. Most exams can be performed at the L.A. Equestrian Center. Under special circumstances examinations can be done at your stable if a dark stall is available. Appointments Patients are seen by appointment only, Please bring any necessary records and lab reports the day of your appointment. For faster service fill out and bring a completed registration form to your first appointment. Download an Auto History form.